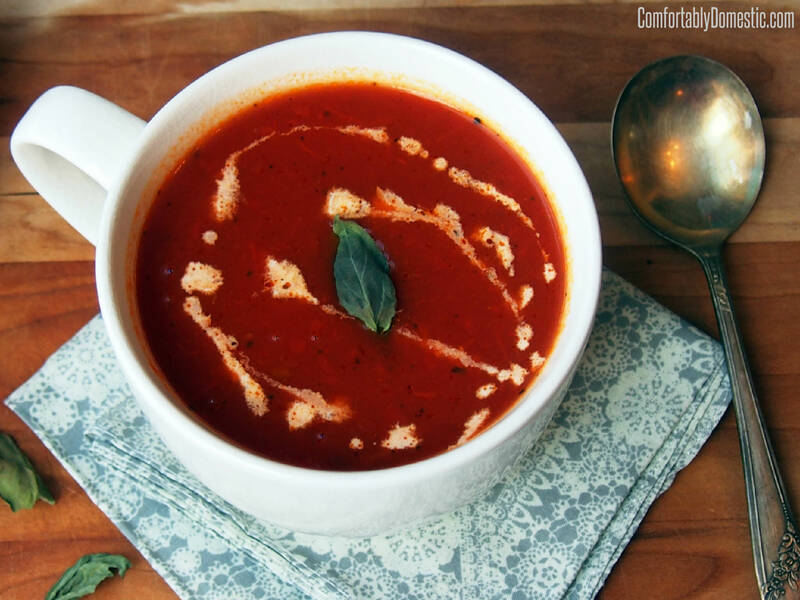 Tomato soup to chase away the chill and bring comfort to the day. Completely homemade, all in under ten minutes! Little did I know as I was sewing hand warmers amid the Polar Vortex sweeping through the 45th Parallel that, after an all-too-brief respite, we’d soon be subjected to Polar Vortex Part 2! More fun than consecutive weeks of sub zero temperatures is more sub zero temperatures! The Sons take this kind of weather in stride–they just put on an extra layer or two before heading outdoors. Then they look at me like I’m nuts when I’m while standing on the porch in my fuzzy slippers, waving my arms like the crazed-half-frozen-mother that I am, begging them to come inside to warm up. “But we’re not even cold! Not even a little bit!” they said. “Um, excuse me Misters, but your beet-red cheeks and patches of white frostbite tell me otherwise!” I snarked back. “But mooooooom! We’re not done building our snow fort!” they continued. Kids are persistent like that. OK, I didn’t really say that. But, I sure as heck thought it while I was chiseling my frozen slippers off the porch so I could go back inside where it was warm. I love winter more than most, but enough’s enough all ready! I feel like the only way to survive all this frigidity is to grab a blanket, wrap myself up Burrito Style, plop in front of the fireplace, and keep a vessel of warm liquid in my hands at all times. When I’m finally able to convince my boys to come inside and out of the cold, they definitely want a big ol’ hot mug of hot comfort to warm them up. Sure, a steamy mug of malted hot chocolate is always an option, but sometimes they need a little something more substantial. At these times, it’s soup weather if ever there was a reason to declare it Soup Weather! On these arctic days, I love having a recipe like Ten Minute Homemade Tomato Soup in my arsenal. By the time my boys have peeled off layers of winter gear, I’m dishing up hot tomato soup. It chases away their chills, filling them up with homemade soup goodness. 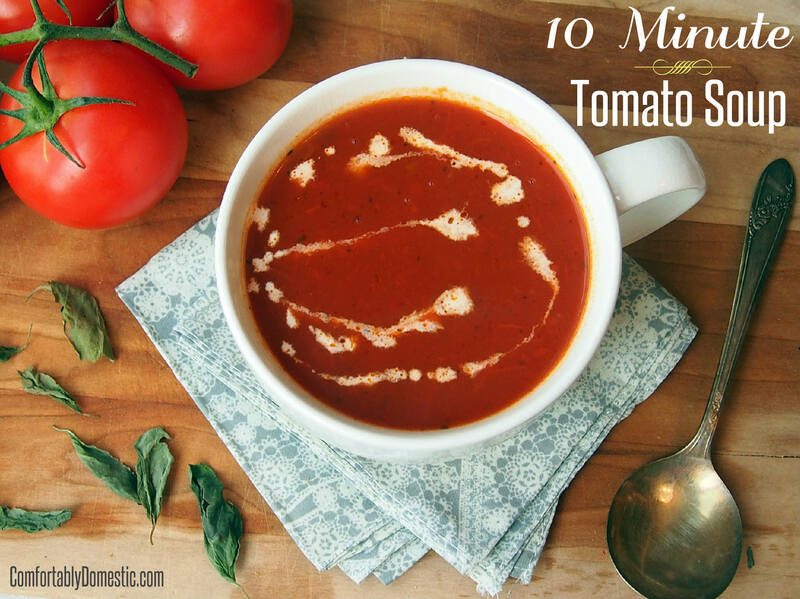 My Ten Minute Tomato Soup is simple to make and packed with flavor. It is not sweet like condensed soup at all. Rather, it relies on savory garlic, basil, and chicken broth to liven up the crushed tomatoes. 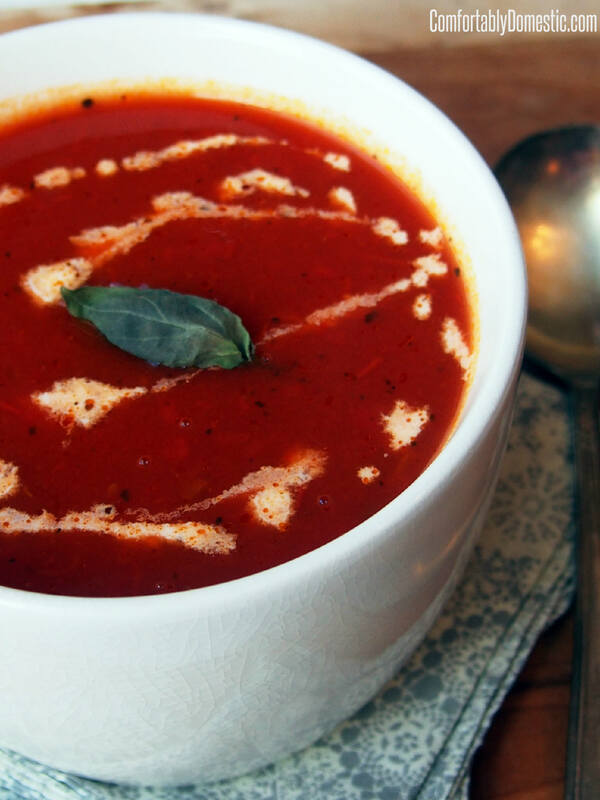 Drizzle in a touch of Half & Half, and you’ve got a scrumptious restaurant quality tomato soup that’s ready in a flash. Of course if you have a few extra minutes to spare, I highly recommend whipping up grilled cheese to go along with the tomato soup. Because grilled cheese is the utensil of choice with which to eat tomato soup. A flavorful, classic tomato soup to chase away the chill and bring comfort to the day—all in under ten minutes. Sauté the garlic in olive oil in a large saucepan set over medium heat for 30 seconds, or until garlic is soft. Sprinkle the salt, basil, and pepper into the pan. Stir the spices with the garlic for an additional 15 seconds, or until the garlic is just barely beginning to brown. Pour the chicken stock and crushed tomatoes into the saucepan. Bring the soup to a boil before lowering the heat to simmer for 3 minutes. Soup is best hot with a drizzle of Half & Half—preferably alongside a gooey grilled cheese sandwich. 8 MINUTES! THAT IS CRAZY! I have been looking for a substitute from Cambles... When my husband and I were with out children...we got a brand in a box...but with kids, its so expensive. Not sure if the lack of sugar would go over well...but I bet ya my trusted agave syrup would fix that. I add it into my home made pasta sauce. 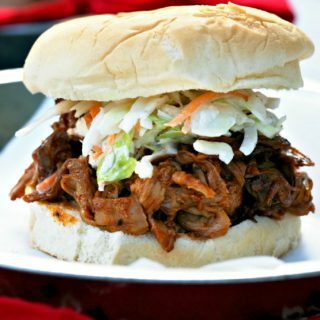 It helped us a lot with the transition from store bought sauces to home made. Just made this soup for the first time. It was a hit with my husband and friend. YAY! So easy to make. Thank you so much for sharing a great recipe! Hooray! I'm so thrilled that you like it. Thanks, Mary Grace! Instead of a can of crushed tomatoes, I used 2 fresh tomatoes diced in a blender for 30 seconds ,it was a perfect bowl of soup! Thanks for the tasty idea! Great improvisation, Darren! Well done. 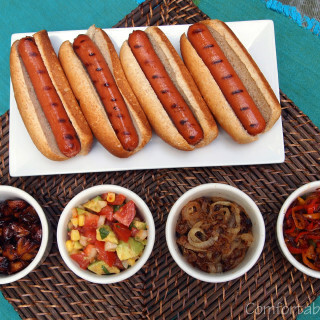 Yup - this with a grilled cheese - can't wait to try it!! Grilled cheese and tomato soup is the best combination ever! I'll be trying that one, cos it sounds good, and I like easy!